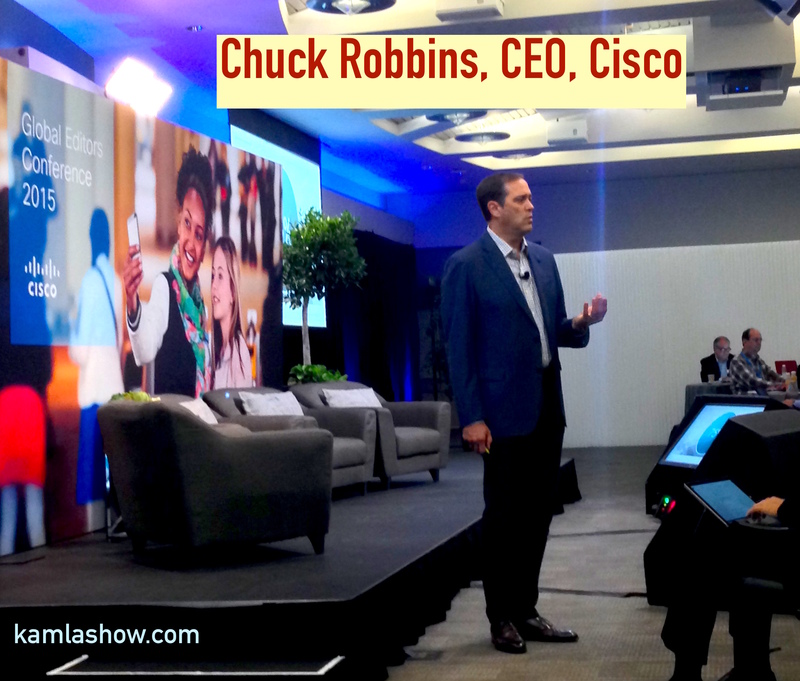 Cisco’s CEO Chuck Robbins is a man in a hurry to change things in the giant networking company. Faster and simpler solutions with an emphasis on analytics and security were the key points Robbins made during the global editors meeting on Oct 5, 2015. This is Robbins first public statement since he became the CEO of Cisco. In the last few years the networking landscape has witnessed a lot of changes especially with the advent of software-defined networking startups and companies. Clearly, these changes are not lost on Robbins, who mentioned a niggling paranoia about the 6 starup guys working in a garage, who may end up disrupting the space.While he has no idea who and where these disruptors may exist, he is acutely aware of that threat. Robbins also mentioned that he started as an application developer and wrote code. Innovating and building new solutions within the company is one of his key priorities. They are deploying small teams to innovate and come up solution within a 11-month period he added. There was barely any talk about Cisco’s core networking hardware, instead Robbins’ focus was on software, security and analytics and the business opportunities presented by 50 billion connected devices by 2020. In this Internet of Things (IoT) world Cisco sees huge business opportunites. He stressed the importance of building a flexible and intelligent network with “security everywhere,” and provide insight into the data though analytics. One of the most interesting partnerships Robbins mentioned was with Fanuc America, where they are testing an IoT solution on the factory floor that use robots. They have deployed a pilot program with General Motor (GM), where they have connected 1,800 of Fanuc’s robots and helped save $38 million dollars for their client. Their new IoT solution helps digitize GM’s factories and improves the efficiency and reduces the maintenance cost of robots. It costs $16,000 per minute when a robot is down. As mentioned earlier on the big opportunity Robbins sees is in the IoT business that will be “bigger than the first wave of the Internet.” Robbins wants to tap into these new opporunties with a fast, simple and clear vision. He is a man in a hurry to make Cisco a digital example of a B2B company. The company still has a lion’s share of the networking hardware market, but does face competition from other players in this field. He did mention that making things simple and clear will be a difficult journey, but he is clearly prepared to roll up his sleeves and steer the giant networking company down the digital highway. Robbins became the CEO of Cisco in July, when John Chambers retired as the company’s CEO after a 20-year stint. Robbins is a17 year Cisco veteran and before becoming CEO was the Vice-President of Field Operations.